What is Tangata Tiriti – Treaty People? Tangata Tiriti – Treaty People is a 125-page book with simple, accurate information about the Treaty of Waitangi in plain English. This information is organised into series of activities for groups to learn about the Treaty. What information does it cover? How are these activities different from other resources on the Treaty of Waitangi? accessible: the resource is written in plain English so that it can be understood by all participants – young and old, including those for whom English is a relatively new language. Who are the activities suitable for? Activities are suitable for anyone who wants a better understanding of the Treaty of Waitangi. Activities are suitable for all tangata tiriti (Tauiwi, including Pākehā) and for tangata whenua. The resources can be used with new migrants, ‘older’ settlers, students, adult learners and employees. 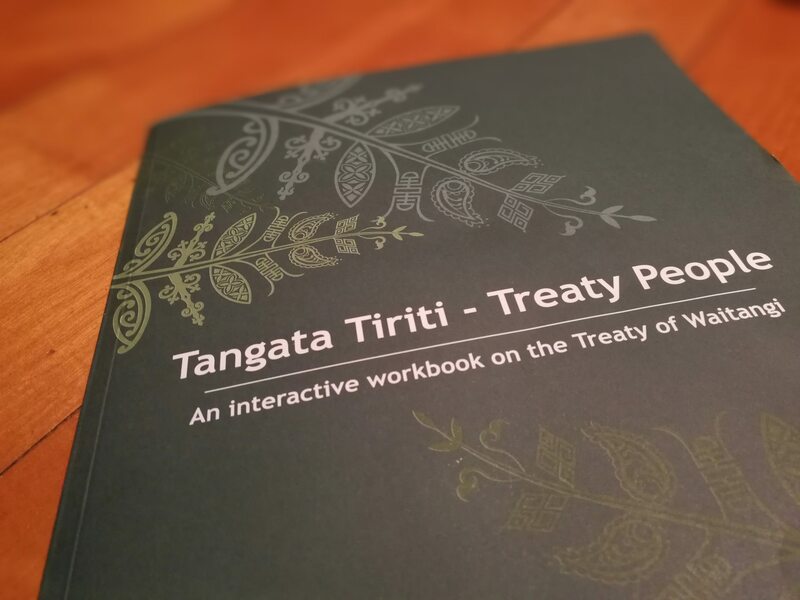 Anyone is free to facilitate activities from the Tangata Tiriti – Treaty People book. It has been used by adult educators, Treaty educators, ESOL teachers, high-school teachers, tertiary educators, workshop facilitators and training managers. What organisations find the book useful? Typical organisations who purchase the book are libraries, private training establishments (PTEs), social service organisations, migrant communities, councils, government and non-government organisations. government agencies wanting refresher training for experienced staff. Activities work best in a group or workshop setting. Core activities are available for download for free on our website. The full publication can be ordered from Auckland Regional Migrant Services or from Treaty Resource Centre.